I’ve been entirely absent from all of my blogs (and most of my social media in general) this year, so in the interest of keeping everyone up to date, I’m posting this on all my various blogs. It’s just an update, so don’t worry, I’m still working on my PhD (and excited about LIS! ), planning another book, and cooking and preserving lots of food. I just haven’t actually started the book or blogged about any of that stuff (yet), but hopefully that will change soon! The main reason this year has been significant is all the things that have happened in it. It’s been a time of major growth and reconnection with many very special and important people in my life, but also unfortunately a time of distancing from others who were not a part of that process in ways that I needed. Between the end of January and the end of October, three of my grandparents died. Every conference I’ve been to this year has been immediately followed or preceded by a funeral, so if you saw me at a conference and I wasn’t my chipper self, it probably wasn’t you! The last of my grandparents to pass did so three days after a dear friend, and one of the most amazing human beings I’ve ever met, was killed in a car crash while I was at a rare live performance of one of my favorite bands. That performance will always be in my heart for its beauty and for the joy I got to share with some other wonderful friends who I watched it with, but also because I can’t imagine a more fitting way for me to have spent Emily’s last moments besides being exactly where she probably would have loved to be. I also had mentioned on all my blogs an impending New York move: That was cancelled at the tail end of January after returning from funeral/conference set number one and hearing from my partner at the time that he was not interested in continuing that partnership. That was good in some ways because I still get to be friends with the person, and I get to move and plan my studies around my own schedule, but at the time there was a decent amount of hurt that went with the experience. By the time my second grandparent died, I felt like I had learned a lot, but still had a lot of learning and processing to do, but I also had a better sense of what to expect. For all the challenges of the year though, there have been plenty of good things. I got to see both sides of my family in the same year, which is a rare treat, spend much-needed and much-desired time with all of them, and hear stories about our family’s past. I got to cook a lot of great meals alongside my friends and family, and share them with people I love. I got a new pet Bearded Dragon and still have three happy and healthy cats. I got to tell a lot of people that I love them. I took my preliminary exam, which ended Monday, and hopefully passed so I can advance to candidacy. I got to offer support to people who needed it, and I learned more about how to be a better support to the people around me. I got an adjuncting position teaching an amazing class at a school that has some amazing faculty, and I got to teach some incredible undergrads in my first ever face-to-face TA assignment. I got to meet new people, develop new relationships, and strengthen the relationships I have too. But I also got a chance to learn when it’s time to create distance between myself and a project or myself and a person when I feel like I’m overwhelmed or need support that I’m not finding there, and that’s huge too. And I got to re-shift some priorities, and make more time to allow myself to heal. There’s not really an ultimate “point” to the post; no major life lesson or anything that I feel an urgent need to share, but I feel like it’s important to put this stuff out there. Many of the people I’m connected to on social media are people who I feel kinship with on some level, and I’m happy you’re all a part of my little corner of the world. And even though this year was crappy, and hurt, and I wasn’t always convinced there would be a light at the end of the tunnel, I’m glad I can take a lot of lessons away from it. I won’t ever stop missing everyone I lost this year, but I also will be better about telling everyone who’s still around how much they mean to me. I’m kind of addicted to tiny vegetables–baby carrots, mini eggplants, and of course, tiny onions. Not to mention that I love savory cocktails, so cocktail onions are kind of a necessity around here. Unfortunately, some of the commercial ones have either a really flat and bland flavor profile or a ton of preservatives that you don’t really need. So, I made my own. It’s slightly herbal, but the brine itself is still simple enough that it doesn’t have a ton of strong flavors that would compete with the onions. Some notes: If you grow your own rosemary and bay leaves, they’ll make this recipe even better. Otherwise, if you don’t have access to the fresh stuff a dried bay leaf and a couple pinches of dried rosemary will work too. Also, you’ll make more brine than you need when you prepare this recipe. I prefer having too much brine to not enough so I don’t have to stop the whole preparation process to make another batch. This recipe yields one pint, but you can multiply it very easily. -Combine all ingredients besides onions and rosemary in a pan and simmer for ten minutes. -Meanwhile, drop the onions (peels and all) into boiling water and boil for three minutes. -Remove the onions to a bowl of ice water. -Cut off the root end of the onion, and gently squeeze the top to push the onion out of its skin. 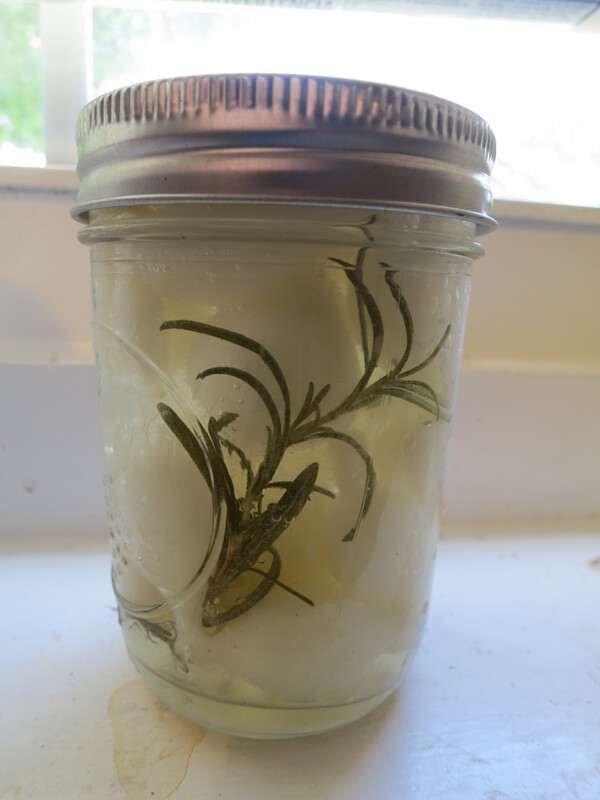 -Remove sterilized jars from water and add a rosemary sprig to the bottom of each. -Divide the onions between the jars, and ladle hot brine over them to cover, leaving 1/2 inch of space in the jar. -Top with lids and rings, place in hot water bath and process for 15 minutes. As many of you know, I moved from Iowa to Florida about two years ago (and moved from Colorado to Iowa about ten years before that). There are things I love about every state I’ve lived in, but one thing that sticks with me is the food. That, and the beer–I’m blessed with a habit of moving to states with really excellent beer options. Each state has its own approach to food, whether that be specialty dishes, portion sizes, food philosophies, or the influences of immigration patterns. Just as each state has shaped me in all other areas of my life, each state’s foodways, and the memories of cooking with friends and family, show up in each dish I prepare. Today, one of my awesome and inspiring library friends posted a photo of some jars of mustard she’s making, and it made me miss Iowa (where I first learned to make mustard). Armed with a Bell’s Midwestern Pale Ale (not from Iowa, I know, but Michigan’s closer than Florida, right?) and one of north Florida’s specialties, Tupelo honey, I went to work. 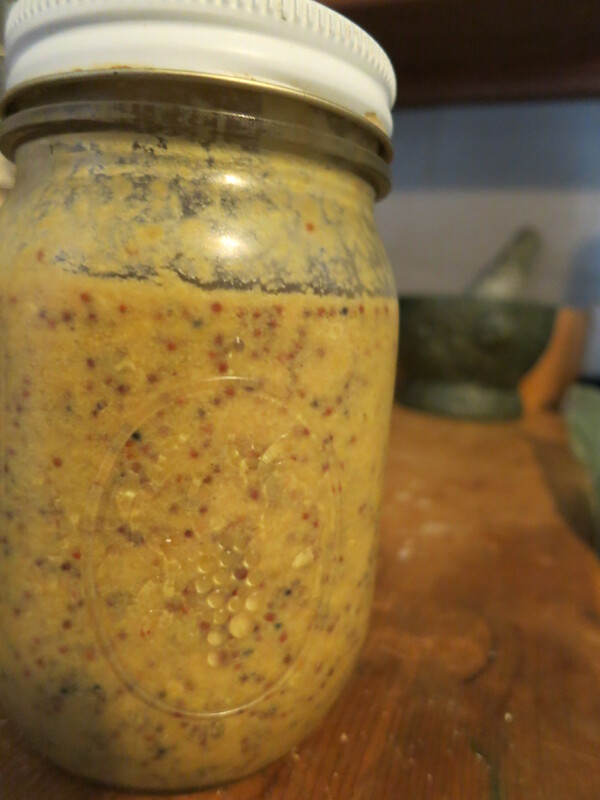 The result is a hearty whole grain mustard with a great flavor. Using a pale ale rather than a stout keeps the flavor light, and this beer in particular balances well with the rich, floral honey. If you haven’t had Tupelo honey, it’s this delicious, thick, magical concoction that is made with the flowers of Tupelo trees, found in swamps in our area of the country. Tupelo honey is unique to this part of the country (and particularly, this part of the South), but it’s delicious enough that if you can’t get it near you it’s worth ordering online. In the spirit of buying local, my honey comes from Orchard Pond farm right here in Tallahassee (and who, conveniently, have their stellar honey for sale on their website). Make sure to use white distilled vinegar in this recipe to keep the flavors crisp–cider or white wine vinegars will overwhelm the subtle yet oh-so-important undertones of the beer and the honey. This mustard is full of flavor, but still mellow enough to go well alongside just about any food you wish. Best of all, this recipe makes just the right amount to fill a pint jar. 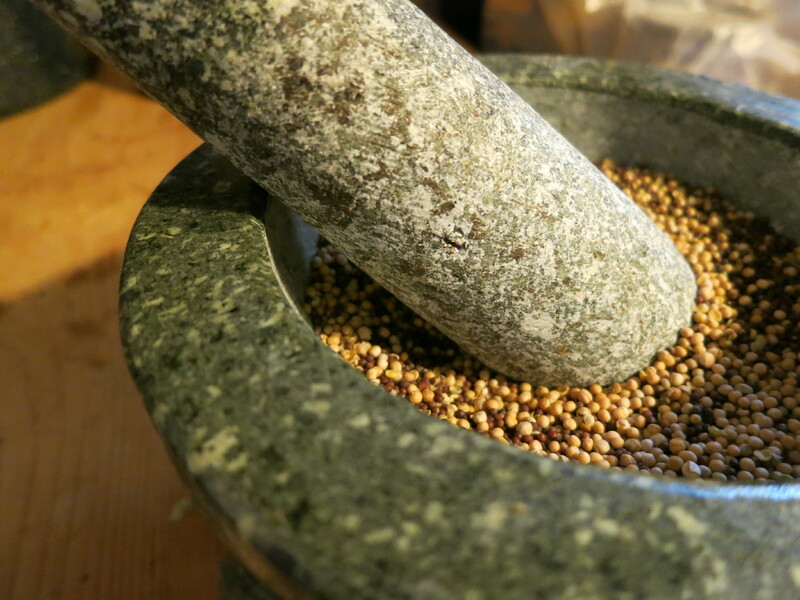 -In a medium saute pan (I used a cast iron skillet), toast the mustard seeds until fragrant. 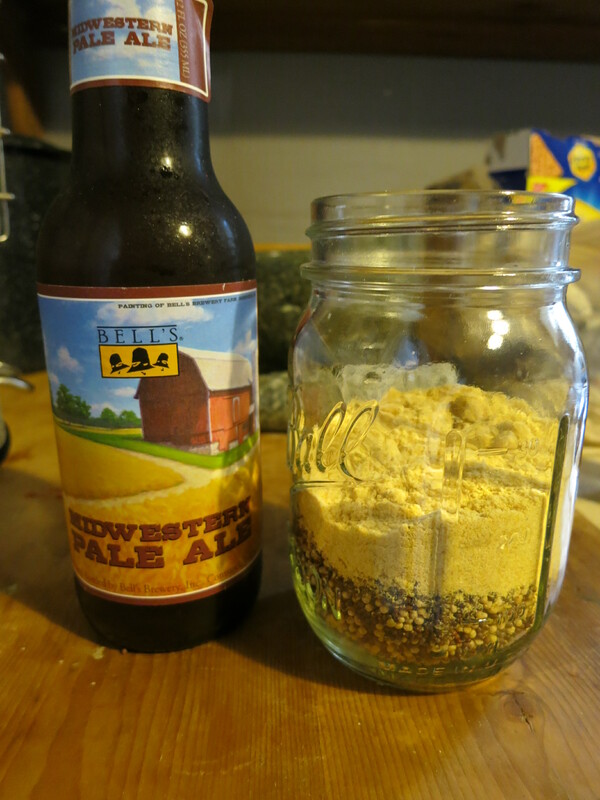 -Add the seeds to a pint jar along with all the other ingredients (honey, mustard powder, beer, salt, vinegar), and stir to combine. -Close the lid, and let it sit in the fridge for two days so the seeds can absorb the moisture from the beer and soften. I had absolutely no idea what to with the carrot. I shaved bits off here and there to add to salads, but it wasn’t even making a dent in the overall amount of carrot in my life. After a few days, I decided to cut it up and roast it off. That one carrot took up the entirety of my largest roasting pan. Once the carrot was roasted, I still didn’t know what to with it. That is, until this morning, when I said ‘I want hummus, but I’m too lazy to rinse off a can of garbanzo beans.’ And thus, I give you this recipe. -Preheat oven to 350. Cut carrots into 1 inch cubes, toss in oil, sprinkle with salt and pepper. Roast until tender (this step can be done ahead). 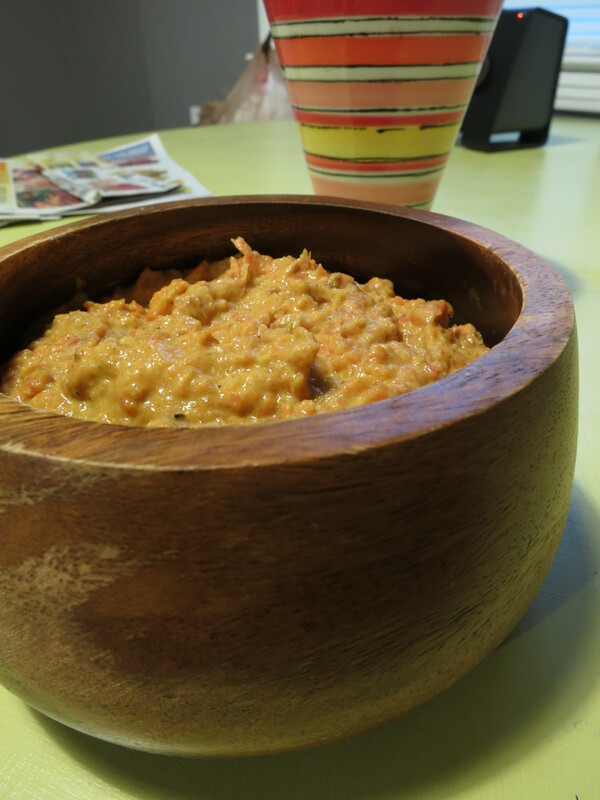 -Combine carrots, tahini, Garam Masala, and salt to taste in a blender or food processor. If using a blender, you may have to add a little water to loosen everything enough to blend. -Process until the hummus is the texture you would like. I left mine a little chunky. In my home town, we have a very special place called the Dushanbe Teahouse. The tea house was a gift from our sister city, which is located in Tajikistan (a country I’d love to visit someday), and is a stunning building that is carved by hand. When I was in high school, the tea house opened as a restaurant and (of course) a purveyor of wonderful teas. The tea house is a place that has gifted me with many great food memories, and served as the venue for meals and conversation with some of my favorite Coloradans. One of these was the candied rosehips that were brought out as a nibbler for guests while they looked over the menu. I remember gobbling down the entire serving before the waiter even returned with my water during my first visit! Apparently, I wasn’t the only one, because the teahouse stopped serving the rosehips not long after (when I asked, they said that the starter was so popular that it was costing them a lot of money to provide them to patrons). That experience is what got me interested in rosehips though, and is the reason I always leap at the chance to eat anything with rosehips in it. Today, I was pondering on what to make for New Year’s treats, and glanced over at a box of dried rosehips I bought before the holiday mayhem and set aside. This is my last New Year’s in Tallahassee (I’m moving to Brooklyn in May), and I’ve made some truly incredible friends during my time here. A few of them are coming over to have champagne and snacks on New Year’s Eve, and I thought the best way to celebrate them and all the wonderful things they’ve brought to my life would be to share a dish with them that takes me back to my home. If you have a special event coming up (New Year’s Eve party, perhaps?) or are looking for a way to use up rosehips, this is a great last-minute treat. Candying dried rosehips is super easy (I promise!) and you’ll be rewarded with a pretty and tasty snack that is incredibly addictive. If you don’t have dried rosehips on hand, don’t fret: you can usually find them in specialty markets and Middle Eastern markets. I used the vanilla sugar to add a bit of warmth, but regular ol’ granulated sugar works just fine here, and you can play around with adding your own flavors. This amount serves 4-6 people. 3. Toss the rosehips in the pan, and toss to evenly coat. Work quickly, since the sugar will start to harden once you remove it from the heat. 5. Allow to cool for at least 20 minutes, then serve! I’ve been wanting to make Tom Yum soup, a tasty and fragrant Thai soup, for a long time. Tom Yum is one of my favorite soups and an awesome comfort food. The flavor is complex, sour, and spicy, and is as good in summer as it is in winter. 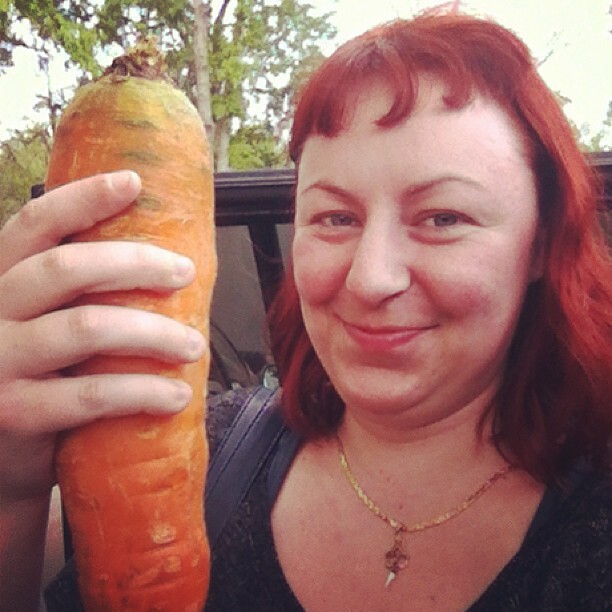 Last week, I got galangal through the farmer’s market (Red Hills Online is the one I use–you order and prepay, then just go pick your produce up. It’s magical). Galangal is a root that looks sort of like ginger, but has a different flavor and more of a bite rather than ginger’s warm spiciness. If you don’t have it in your area, you may be able to find it dried. To make my soup, I followed the order this site uses to add the ingredients, but measured as I went along. I also left the shells on the shrimp when I cooked them, as this adds extra flavor to the broth. I’ve met quite a few people who don’t know how to devein shrimp with the shells on, so I’ve made a photo tutorial for you at the end of the post. In my research I’ve found tons of variations, so this soup can be used for the basis of many tasty experiments! -Heat the stock over medium heat until simmering. Add 1 tsp sea salt (if desired). -Lay the lemongrass on a cutting board and hit (not *too* hard) with the back of a knife to release the flavor. Cut into two-inch pieces, and add to stock. -Peel the galangal with a spoon, slice into 1/4-inch pieces, and add to the broth. -Tear the kaffir lime leaves into about 4-6 pieces each and add to the broth. -Peel and thinly slice the shallots, and throw into the pot. -Add your chili paste (or cayenne sauce if you’re me) and stir. -Quarter the tomatoes and mushrooms, and add to the broth. -Chop the cilantro, and add to the pot. -After you’ve deveined your shrimp, add them to the broth and turn off the heat. Let sit for 2 1/2 – 3 minutes. -Ladle the soup into bowls, and garnish with fresh-sliced peppers (I used fresh cayenne peppers) and a squeeze of lime juice. The ‘vein’ in a shrimp is actually a part of the digestive tract, and is filled with grit that is not too fun to eat. Thankfully, taking the vein out is easy, and it’s as easy to do with the shell on as it is to do with shelled shrimp. Don’t laugh too much at the photos, it’s hard to photograph one-handed while cooking! Step One: Slice down the back with kitchen shears. Make sure to go down the middle, where you would normally take the vein out. Step Two: Hold the legs together and press so that the back of the shrimp spreads apart and you can see the vein. Step Three: Using a knife with a thin blade, slide the point under the vein and lift to remove. Pull with your fingers and discard. Given how much I love making and eating sauerkraut (this is the recipe I use), it should come as no great shock that I also love its spicy, but also fermented cabbage-y, cousin kimchi. I do a hybrid of a couple recipes, and honestly I don’t always measure out each ingredient, but I’ll put down a rough estimate of what I usually use for you to use as a guide. I’ve also put bean sprouts in a couple times, although I’ve been told it’s even better without them by the folks I’ve shared it with (I happen to like it both ways). I’ve been meaning to write down what I put in mine for a while after a few requests, so here you go! I know the post is a bit long and rambling, but I promise the process is as simple as chopping and grating some things, tossing them with tasty flavorings, and letting them sit there a while. The purpose of all the words and steps isn’t to scare anyone off, it’s to try to clarify the process as much as possible so you won’t be intimidated by making this incredibly simple and heathy food. And the reward is jar upon jar of delicious kimchi! -chopped garlic scapes (or green garlic; it looks like scallions)–I use one bunch, which usually has about a dozen of the little guys in it. *I use about 1/4 cup in mine, which is spicy but doesn’t punch you in the face too much. You can obviously adjust it to your tastes. The same peppers are available in powder form, which is what is traditionally used, but until recently I had trouble finding it so I’ve always just used the paste). **Fish sauce won’t make your kimchi taste like fish–instead, it gives it a savory flavor that is delicious. You’ll find the amount that’s right for you, but I tend to stick with a few generous splashes from my bottle when making a batch. My technique is a combination of the sauerkraut recipe I mentioned before, and this very helpful kimchi primer. I use Tigress’ primer to feel out the proportions of ingredients I want to use, what size pieces to cut the cabbage into, how long to soak everything, etc. I use the Headspace kraut-in-a-jar method for the actual fermentation, because it keeps the lid on tightly enough to help calm my paranoia about bugs getting in my food (I am in Florida, after all), and because it keeps the house from smelling like fermented cabbage (which my upstairs neighbor probably appreciates). Just like with the kraut, make sure to loosen the ring on your lid ever-so-slightly every few days, or when you press on the top of the jar and it doesn’t give it all. If you don’t release a bit of pressure once in a while, you risk getting a face full of brine when you do open the jar to check on your food. Incidentally, you can use the same in-jar method for my new favorite hot sauce, which I made a *ton* of this year. 1. Wash all your veggies, grate the radish and ginger, chop the garlic scapes, and core and chop your cabbage. 3. Pour brine (or salt water) over the veggies to cover them. For my brine (and all my salt needs), I only use fine sea salt, which is available in my natural food co-op in bulk and which has a flavor and texture I prefer over other salts. Tigress calls for 1/4 c sea salt to quart of water, which is roughly the ratio I use as well. 4. The next day, drain your veggies with a fine mesh strainer (but preserve the brine!) and toss them with the fish sauce and the hot pepper paste until everything is nice and thoroughly coated (I wear latex gloves for this). 5. Put the mixture into jars, filling most (but not all) of the way (I follow Tigress here too and go with 3/4 full). Pour the reserved brine over the top of each jar until the mixture is covered, then put on the lids and set aside to ferment (I choose a place away from direct sunlight or heat, such as the corner of my counter top). *I’ve also made a quick kimchi without the overnight soaking before, and it turned out pretty well (although the soaked version was a tad better). If you’re in a rush, you can skip the overnight soaking (steps 2-3). Just make sure you are still combining all your veggies before you mix them with peppers and jar them up so you get some of each in all your jars. Once your kimchi is all jarred up, it’s just a matter of waiting for it to ferment as long as you’d like. The speed of fermentation varies dramatically depending on all sorts of environmental factors, so I check any ferment I’m doing every day. I open the jars and smell the kimchi, and I’ll pluck a piece out to taste. If it’s not done, you’ll know (really), and once it gets to a level of softness and ferment-y flavor that you like, go ahead and put it in the fridge (which is cool enough to keep the probiotic critters from continuing to ferment it). Kimchi keeps for a long time (Tigress says a year, I’ve never kept it around much longer than a month before I’ve eaten through it or given it away as gifts), and goes with just about everything. Do you have other ways of preparing kimchi? Other ingredients you prefer? Let me know in the comments! Modernizing Markham Now Available as a Book! There has been a bit of radio silence on the blog for a few months, but with very good reason: I’ve just published Modernizing Markham as a book! For those who aren’t familiar with that project, MM is my food and book history blog, where I try to recreate early modern English recipes using modern ingredients and equipment. I also discuss the history of the cookbook I work from (The English Housewife), along with the history of the different foods I create, to try to help contextualize my work. It’s a lot of fun, and eventually it’s going to be a part of a series of books that deal with different types of recipes or different aspects of history! All the recipes from the original blog are included, along with the historical discussions and some additional goodies that aren’t on the blog. As an added bonus, I’m donating a portion of my profits to the Center for the Book, which gave me tons of support and guidance as I worked on the project. To order a copy, you can share the ISBN (available on the Candle Light Press website) with your favorite local bookseller, or you can order it online from Amazon or Barnes and Noble. I’m also having a release party on December 14th at the Spaceport Bar (in the back of Waterworks), so if you’re in the Tallahassee area, stop by and get your copy signed if you would like! I planted a ton of basil this year, and I’ve been looking for ways to preserve it so I can enjoy it in the winter. I searched around for lacto-fermented pesto recipes, but all the ones I found seemed to have a ton of brine in them. Then the thought occurred that I could modify the sauerkraut recipe I use to get enough basil packed in the jars to make a thicker pesto. Best of all, it’s super easy! Once the pesto is done fermenting, just dump the whole jar into the blender or food processor and process until it’s the texture you like. As an added bonus, toss the stems in some water with some sugar and a pinch of sea salt to make an excellent basil simple syrup. I made two jars so I could try it out, and it worked very well! I ate one jar right away, and canned the other in a hot water bath to see if it would hold up (it does). The flavor is about the same as regular old pesto, but slightly more savory thanks to the fermentation process. Because it’s packed in brine, it also is thinner than traditional pesto, but still is a good consistency to toss with pastas, stir in to soups, or add to just about anything else! The jars prior to fermenting. 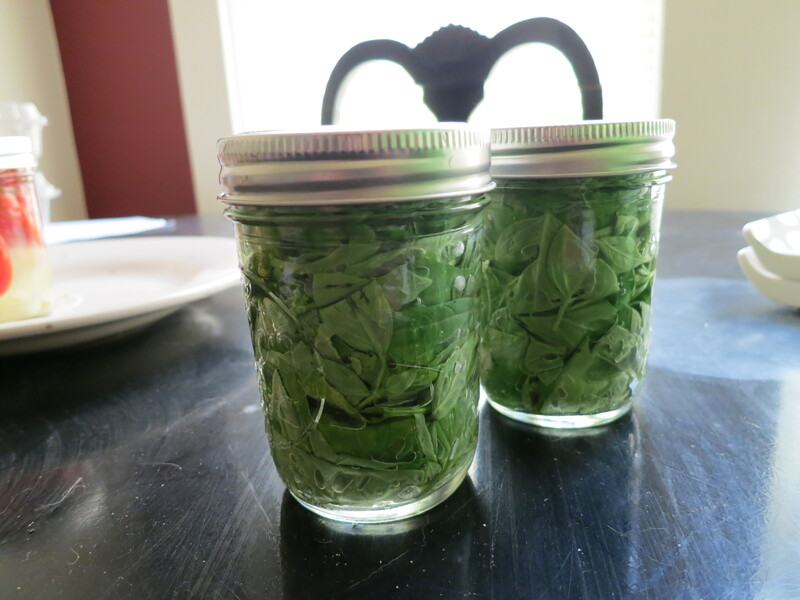 -Tightly pack the basil leaves into the pint jars, pressing down as you add more leaves to the jars. -Place a clove of garlic on top of each jar. -Mix the salt in the water until dissolved. -Pour the brine over the leaves until they are covered. -Place the lids of the jars and set aside for two weeks to ferment. -Combine water, salt, and basil in a pot. -Heat until simmering, and simmer for 7-10 minutes or until the infusion is as strong as you would like. -Add the sugar and stir until dissolved. Holy Crap I Made Something Tasty!